I was reminded of Foster Wallace’s joke while at Indiana University earlier this month for the event Speaking Truth to Power: Media Capture, Disinformation, and Democracy co-organized by CIMA and Indiana University’s School for Global and International Studies (SGIS). At the event, several frontline democracy activists, such as Maxine Tanya Hamada and Natalia Arno, described how the media environment itself is a strategically important space in the struggle for democracy. I wondered to what extent the students in the audience—all of them digital natives—took their media environment for granted. While it is essential for every student to question the taken-for-grantedness of our current media environment, it is especially important that students at schools like SGIS, which will shape a generation of international leaders, are not just media literate, but media policy literate.1 By this I mean a familiarity with the policies, regulations, market forces, and social dynamics that shape our media systems. The panelists at the event made it clear why current trends cannot be accepted as inevitable. The digital media revolution, once expected to usher in greater media pluralism, has instead weakened news media at the foundation of its business model and made news outlets more susceptible to capture by narrow interests. At the same time, digital media has also allowed for supercharged disinformation campaigns. Russia and China have taken advantage of these fragilities in global media systems to expand their authoritarian models of communication. These trends have been integral to the declining trust in democratic institutions around the globe, from the Philippines to Hungary to the United States. The event also highlighted the myriad ways that international organizations, non-governmental groups, and local activists are working to reverse these trends. What is already clear, however, is that the solution will not lie exclusively in journalism (though that will remain important), but in broader approaches to ensure that information flows and communication can support democratic politics. 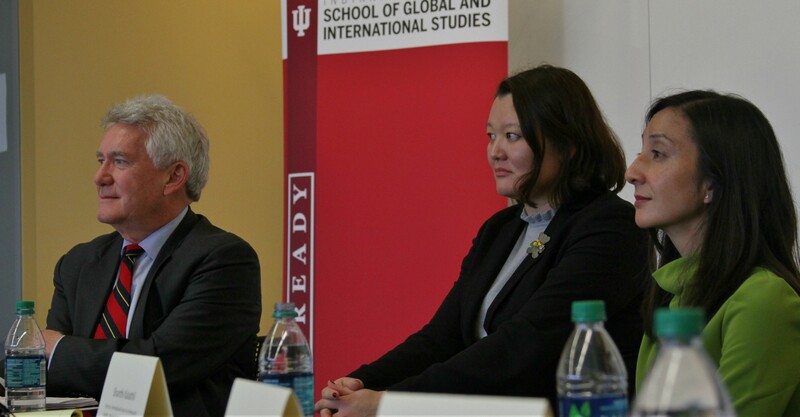 At CIMA, we have been committed to stimulating inter-disciplinary and policy-oriented thinking on media systems, including by sponsoring the Mark Helmke Postdoctoral Scholarship on Global Media, Development, and Democracy at Indiana University. But much more work is needed as there is no silver bullet and no technical fix. Speaking at the event, NED’s own president, Carl Gershman, called it the “most dangerous time for democracy” that he has witnessed in his career. Broad-based, cross-border coalitions with international support (financial and political) will be essential for building a coordinated and effective global movement to meet 21st century challenges to plural and democratic media. The students at SGIS and elsewhere will inherit the challenge of ensuring that the international community is up to the task; these programs must continue to remind them that the media environment cannot be taken for granted. See Becky Lentz, “Media Policy Literacy: A Foundation for Media Reform”, In Strategies for Media Reform: International Perspectives, edited by Des Freedman, Jonathan Obar, Cheryl Martens, and Robert W. McChesney, (New York: Fordham University Press), 2016. Nicholas Benequista is the Research Manager & Editor at the Center for International Media Assistance. Find him on Twitter at @benequista.